We offer five different party packages, all of which are great fun for children and brilliant value for parents! Each party is run by a highly trained, DBS checked Fun Scientist, complete with lab coat and science equipment. They will come to your venue, bring all the equipment for the science, and run a fantastic, engaging party with plenty of wow-factor. They will even clean up afterwards! A generous helping of flying saucers, popping candy, sherbet sticks, a bouncy ball and a growing animal. A generous helping of flying saucers, popping candy, a bouncy ball, sherbet sticks, a growing animal and a horrible science book. Two fantastic sessions of science! A chemical/electrical extravaganza for roughly 65 minutes before a 30 min break (an ideal time to serve food, do the cake, or play party games). 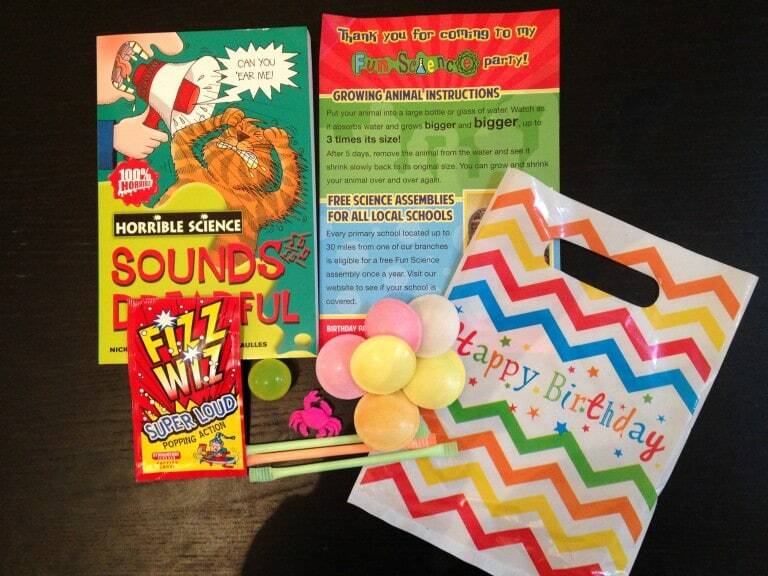 After the break, our scientist returns to run a 35 minute sweets and surprises party!